The SHS CNC Gen3 Super High Speed Gear Set is ideal to be used with a spring between M90 or M110. 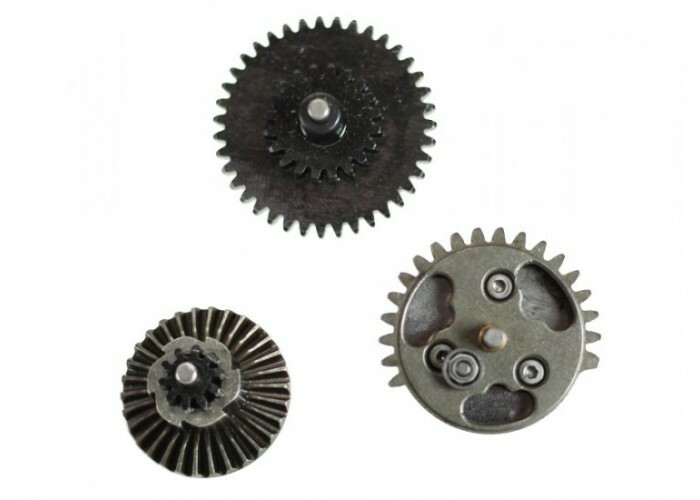 SHS Gear sets are not only constructed out of a strong material but is also heat treated on the surface of the gears to maintain the longevity of the gear set. Have these in your kit just in case you original gears become damaged from your high performance build. Overall, this is an exceptional product and worthy upgrade for the price. The gear set is meant for version 7 type gearboxes. I dont play much with this gun but here are the pros and cons so far. -Spur and Sector gear have individual ball bearing bushings inside them with a detachable shaft. - BE CAREFUL WITH WITH SECTOR GEAR. I notice the screws were coming loose when doing immanence and the gears almost separating. This caused tremendous stress on the screws and one of them sheared. the other two were starting to shear. If you don't know what this means the screws were basically starting the break in half. -Loctite the screws or double check and hand tighten the screws before installing.